Do you want to get caught by a nasty surprise, the next time you go online shopping on your Mac? If not, you may want to remove traces of browsing history on various websites. Particularly the ones that involves money exchange and identity such shopping, banking, social networking sites. Safari is one of the most user-friendly and convenient web browsers that takes your privacy seriously. Although, Safari always included the ability to delete web history, website data, searches and cookies on a Mac; but the latest version has accelerated the handiness to another level. You’re now provided with four possible options to clear recent web browsing history in Safari for Mac: remove website data from only the prior hour of browsing, delete website history data from today, delete browser data from today and yesterday, or, go all out and remove all data from the beginning of time. Pull down the Safari menu and select ‘Clear History…’ on the Safari web browser window. 3. 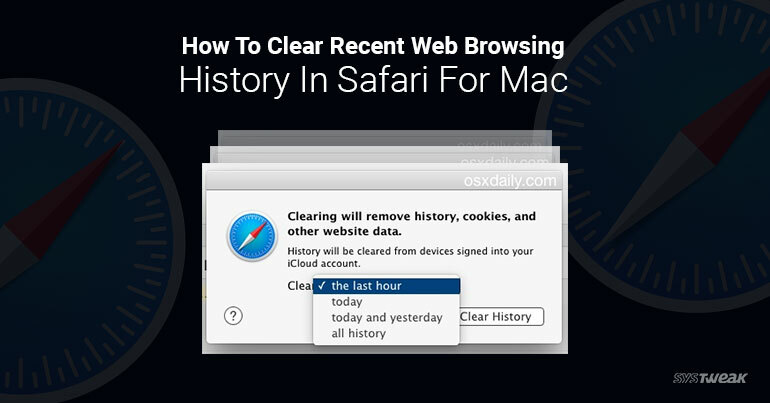 After making your selection, click on Clear History button, which clears web browsing history in Safari. You don’t have to relaunch the Safari or restart your Mac as the changes are made immediately. A note is displayed, informing you that “History will be cleared from devices signed into your iCloud account”. It means, it is a great way of deleting web history remotely from other devices, which are connected and synced through the same Apple ID. Overall, its requires no great efforts to clear recent web browsing history in Safari, but you can also consider using the ‘New Private Window’ that prevents any site history, caches, cookies, or data from being stored, except for that specific session.